matplotlib includes a framework for arbitrary geometric transformations that is used determine the final position of all elements drawn on the canvas. Transforms are composed into trees of TransformNode objects whose actual value depends on their children. When the contents of children change, their parents are automatically invalidated. The next time an invalidated transform is accessed, it is recomputed to reflect those changes. This invalidation/caching approach prevents unnecessary recomputations of transforms, and contributes to better interactive performance. The backends are not expected to handle non-affine transformations themselves. A mutable 2D affine transformation. If matrix is None, initialize with the identity transform. Reset the underlying matrix to the identity transform. Return a new Affine2D object that is the identity transform. Unless this transform will be mutated later on, consider using the faster IdentityTransform class instead. Add a rotation (in radians) to this transform in place. Returns self, so this method can easily be chained with more calls to rotate(), rotate_deg(), translate() and scale(). Add a rotation (in radians) around the point (x, y) in place. Add a rotation (in degrees) to this transform in place. Add a rotation (in degrees) around the point (x, y) in place. Adds a scale in place. If sy is None, the same scale is applied in both the x- and y-directions. Set this transformation from the frozen copy of another Affine2DBase object. Adds a skew in place. xShear and yShear are the shear angles along the x- and y-axes, respectively, in radians. xShear and yShear are the shear angles along the x- and y-axes, respectively, in degrees. Adds a translation in place. The base class of all 2D affine transformations. This class provides the read-only interface. For a mutable 2D affine transformation, use Affine2D. Subclasses of this class will generally only need to override a constructor and get_matrix() that generates a custom 3x3 matrix. Returns a frozen copy of this transform node. The frozen copy will not update when its children change. Useful for storing a previously known state of a transform where copy.deepcopy() might normally be used. Return the corresponding inverse transformation. The return value of this method should be treated as temporary. An update to self does not cause a corresponding update to its inverted copy. Return the values of the matrix as an (a, b, c, d, e, f) tuple. Performs only the affine part of this transformation on the given array of values. transform(values) is always equivalent to transform_affine(transform_non_affine(values)). In non-affine transformations, this is generally a no-op. In affine transformations, this is equivalent to transform(values). Accepts a numpy array of shape (N x input_dims) and returns a numpy array of shape (N x output_dims). Alternatively, accepts a numpy array of length input_dims and returns a numpy array of length output_dims. A convenience function that returns the transformed copy of a single point. The point is given as a sequence of length input_dims. The transformed point is returned as a sequence of length output_dims. The base class of all affine transformations of any number of dimensions. Get the affine part of this transform. Performs the transformation on the given array of values. Performs only the non-affine part of the transformation. In non-affine transformations, this is generally equivalent to transform(values). In affine transformations, this is always a no-op. In some cases, this transform may insert curves into the path that began as line segments. Returns a path, transformed only by the affine part of this transform. transform_path(path) is equivalent to transform_path_affine(transform_path_non_affine(values)). Returns a path, transformed only by the non-affine part of this transform. A 2x2 numpy array of the form [[x0, y0], [x1, y1]]. If you need to create a Bbox object from another form of data, consider the static methods unit(), from_bounds() and from_extents(). Return (x0, y0, width, height). Create a new Bbox from x0, y0, width and height. width and height may be negative. Create a new Bbox from left, bottom, right and top. Get the points of the bounding box directly as a numpy array of the form: [[x0, y0], [x1, y1]]. Set whether the existing bounds of the box should be ignored by subsequent calls to update_from_data_xy(). When True, subsequent calls to update_from_data_xy() will ignore the existing bounds of the Bbox. When False, subsequent calls to update_from_data_xy() will include the existing bounds of the Bbox. The pair of x coordinates that define the bounding box. This is not guaranteed to be sorted from left to right. The pair of y coordinates that define the bounding box. This is not guaranteed to be sorted from bottom to top. Return whether the bbox has changed since init. Return whether the x-limits have changed since init. Return whether the y-limits have changed since init. Create a new null Bbox from (inf, inf) to (-inf, -inf). The first pair of (x, y) coordinates that define the bounding box. This is not guaranteed to be the bottom-left corner (for that, use min). The second pair of (x, y) coordinates that define the bounding box. This is not guaranteed to be the top-right corner (for that, use max). Set this bounding box from the "frozen" bounds of another Bbox. Set the points of the bounding box directly from a numpy array of the form: [[x0, y0], [x1, y1]]. No error checking is performed, as this method is mainly for internal use. Create a new unit Bbox from (0, 0) to (1, 1). Update the bounds of the Bbox based on the passed in data. After updating, the bounds will have positive width and height; x0 and y0 will be the minimal values. A numpy array of 2D points. When True, ignore the existing bounds of the Bbox. When False, include the existing bounds of the Bbox. When None, use the last value passed to ignore(). When True, update the x/y values. The first of the pair of x coordinates that define the bounding box. This is not guaranteed to be less than x1 (for that, use xmin). The second of the pair of x coordinates that define the bounding box. This is not guaranteed to be greater than x0 (for that, use xmax). The first of the pair of y coordinates that define the bounding box. This is not guaranteed to be less than y1 (for that, use ymin). The second of the pair of y coordinates that define the bounding box. This is not guaranteed to be greater than y0 (for that, use ymax). This is the base class of all bounding boxes, and provides read-only access to its data. A mutable bounding box is provided by the Bbox class. The canonical representation is as two points, with no restrictions on their ordering. Convenience properties are provided to get the left, bottom, right and top edges and width and height, but these are not stored explicitly. A string representing the "name" of the transform. The name carries no significance other than to improve the readability of str(transform) when DEBUG=True. Return a copy of the Bbox shifted to position c within container. a string: - 'C' for centered - 'S' for bottom-center - 'SE' for bottom-left - 'E' for left - etc. The box within which the Bbox is positioned; it defaults to the initial Bbox. Return whether (x, y) is in the bounding box or on its edge. Return whether x is in the closed (x0, x1) interval. Return whether y is in the closed (y0, y1) interval. Return the corners of this rectangle as an array of points. Specifically, this returns the array [[x0, y0], [x0, y1], [x1, y0], [x1, y1]]. Count the number of vertices contained in the Bbox. Any vertices with a non-finite x or y value are ignored. vertices : Nx2 Numpy array. Count the number of bounding boxes that overlap this one. Construct a Bbox by expanding this one around its center by the factors sw and sh. Return (x0, y0, x1, y1). TransformNode is the base class for anything that participates in the transform tree and needs to invalidate its parents or be invalidated. This includes classes that are not really transforms, such as bounding boxes, since some transforms depend on bounding boxes to compute their values. Return whether x, y is in the bounding box, but not on its edge. Return whether x is in the open (x0, x1) interval. Return whether y is in the open (y0, y1) interval. Return whether this bounding box overlaps with the other bounding box, not including the edges. The (signed) height of the bounding box. Return the intersection of bbox1 and bbox2 if they intersect, or None if they don't. Construct a Bbox by statically transforming this one by the inverse of transform. Return whether this is the unit box (from (0, 0) to (1, 1)). The top-right corner of the bounding box. The bottom-left corner of the bounding box. Return whether this bounding box overlaps with the other bounding box. Construct a Bbox by padding this one on all four sides by p.
Return a new bounding box that bounds a rotated version of this bounding box by the given radians. The new bounding box is still aligned with the axes, of course. Return a copy of the Bbox, shrunk by the factor mx in the x direction and the factor my in the y direction. The lower left corner of the box remains unchanged. Normally mx and my will be less than 1, but this is not enforced. Return a copy of the Bbox, shrunk so that it is as large as it can be while having the desired aspect ratio, box_aspect. If the box coordinates are relative---that is, fractions of a larger box such as a figure---then the physical aspect ratio of that figure is specified with fig_aspect, so that box_aspect can also be given as a ratio of the absolute dimensions, not the relative dimensions. The (signed) width and height of the bounding box. Return a list of new Bbox objects formed by splitting the original one with vertical lines at fractional positions given by args. Return a list of new Bbox objects formed by splitting the original one with horizontal lines at fractional positions given by args. 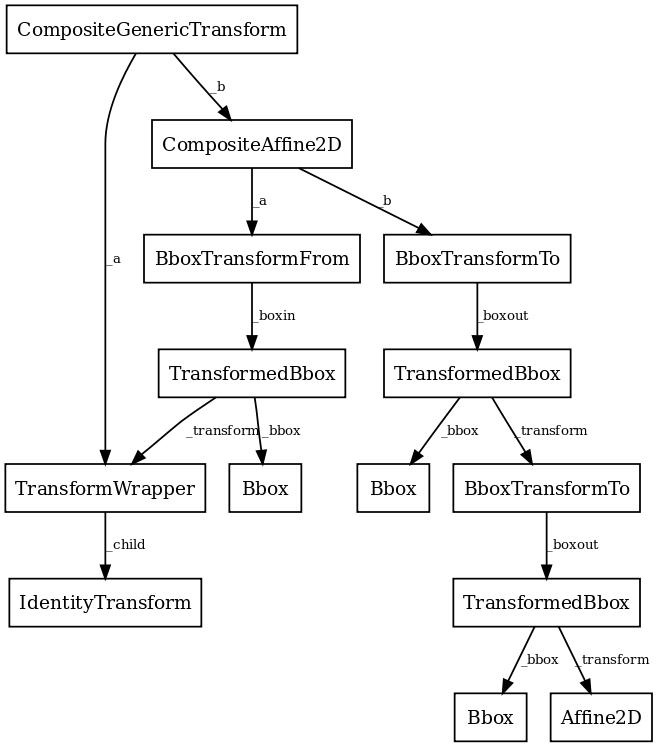 Construct a Bbox by statically transforming this one by transform. Construct a Bbox by translating this one by tx and ty. Return a Bbox that contains all of the given bboxes. The (signed) width of the bounding box. The right edge of the bounding box. The left edge of the bounding box. The top edge of the bounding box. The bottom edge of the bounding box. BboxTransform linearly transforms points from one Bbox to another. Create a new BboxTransform that linearly transforms points from boxin to boxout. Get the Affine transformation array for the affine part of this transform. BboxTransformFrom linearly transforms points from a given Bbox to the unit bounding box. BboxTransformTo is a transformation that linearly transforms points from the unit bounding box to a given Bbox. Create a new BboxTransformTo that linearly transforms points from the unit bounding box to boxout. BboxTransformTo is a transformation that linearly transforms points from the unit bounding box to a given Bbox with a fixed upper left of (0, 0). A "blended" transform uses one transform for the x-direction, and another transform for the y-direction. This version is an optimization for the case where both child transforms are of type Affine2DBase. Create a new "blended" transform using x_transform to transform the x-axis and y_transform to transform the y-axis. Both x_transform and y_transform must be 2D affine transforms. You will generally not call this constructor directly but use the blended_transform_factory function instead, which can determine automatically which kind of blended transform to create. Returns whether the given branch is a sub-tree of this transform on each separate dimension. This "generic" version can handle any given child transform in the x- and y-directions. Return whether the given transform is a sub-tree of this transform. This routine uses transform equality to identify sub-trees, therefore in many situations it is object id which will be used. For the case where the given transform represents the whole of this transform, returns True. Returns the number of transforms which have been chained together to form this Transform instance. For the special case of a Composite transform, the maximum depth of the two is returned. A composite transform formed by applying transform a then transform b. This version is an optimization that handles the case where both a and b are 2D affines. Create a new composite transform that is the result of applying transform a then transform b. Both a and b must be instances of Affine2DBase. You will generally not call this constructor directly but use the composite_transform_factory function instead, which can automatically choose the best kind of composite transform instance to create. This "generic" version can handle any two arbitrary transformations. A special class that does one thing, the identity transform, in a fast way. A Bbox where some elements may be locked at certain values. When the child bounding box changes, the bounds of this bbox will update accordingly with the exception of the locked elements. The child bounding box to wrap. The locked value for x0, or None to leave unlocked. The locked value for y0, or None to leave unlocked. The locked value for x1, or None to leave unlocked. The locked value for y1, or None to leave unlocked. float or None: The value used for the locked x0. float or None: The value used for the locked x1. float or None: The value used for the locked y0. float or None: The value used for the locked y1. A transformation that translates by xt and yt, after xt and yt have been transformed by scale_trans. The base class of all TransformNode instances that actually perform a transformation. All non-affine transformations should be subclasses of this class. New affine transformations should be subclasses of Affine2D. True if this transform has a corresponding inverse transform. The number of input dimensions of this transform. Must be overridden (with integers) in the subclass. True if this transform is separable in the x- and y- dimensions. The number of output dimensions of this transform. Must be overridden (with integers) in the subclass. Transforms a set of angles anchored at specific locations. The points where the angles are anchored. Whether angles are radians or degrees. For each point in pts and angle in angles, the transformed angle is computed by transforming a segment of length pushoff starting at that point and making that angle relative to the horizontal axis, and measuring the angle between the horizontal axis and the transformed segment. Transform the given bounding box. Note, for smarter transforms including caching (a common requirement for matplotlib figures), see TransformedBbox. Invalidate this TransformNode and triggers an invalidation of its ancestors. Should be called any time the transform changes. If pass_through is True, all ancestors will always be invalidated, even if 'self' is already invalid. Set the children of the transform, to let the invalidation system know which transforms can invalidate this transform. Should be called from the constructor of any transforms that depend on other transforms. A helper class that holds a single child transform and acts equivalently to it. This is useful if a node of the transform tree must be replaced at run time with a transform of a different type. This class allows that replacement to correctly trigger invalidation. Note that TransformWrapper instances must have the same input and output dimensions during their entire lifetime, so the child transform may only be replaced with another child transform of the same dimensions. child: A class:Transform instance. This child may later be replaced with set(). Replace the current child of this transform with another one. The new child must have the same number of input and output dimensions as the current child. A Bbox that is automatically transformed by a given transform. When either the child bounding box or transform changes, the bounds of this bbox will update accordingly. A TransformedPatchPath caches a non-affine transformed copy of the Patch. This cached copy is automatically updated when the non-affine part of the transform or the patch changes. A TransformedPath caches a non-affine transformed copy of the Path. This cached copy is automatically updated when the non-affine part of the transform changes. Paths are considered immutable by this class. Any update to the path's vertices/codes will not trigger a transform recomputation. Return a fully-transformed copy of the child path. Return a copy of the child path, with the non-affine part of the transform already applied, along with the affine part of the path necessary to complete the transformation. Return a copy of the child path, with the non-affine part of the transform already applied, along with the affine part of the path necessary to complete the transformation. Unlike get_transformed_path_and_affine(), no interpolation will be performed. A faster version of the blended transform is returned for the case where both child transforms are affine. Shortcut versions of the blended transform are provided for the case where both child transforms are affine, or one or the other is the identity transform. Check, inclusively, whether an interval includes a given value. A 2-length sequence, endpoints that define the interval. Value to check is within interval. Returns True if given val is within the interval. Check, excluding endpoints, whether an interval includes a given value. Modify the endpoints of a range as needed to avoid singularities. Fractional amount by which vmin and vmax are expanded if the original interval is too small, based on tiny. Threshold for the ratio of the interval to the maximum absolute value of its endpoints. If the interval is smaller than this, it will be expanded. This value should be around 1e-15 or larger; otherwise the interval will be approaching the double precision resolution limit. If True, swap vmin, vmax if vmin > vmax. Endpoints, expanded and/or swapped if necessary. If either input is inf or NaN, or if both inputs are 0 or very close to zero, it returns -expander, expander. Return a new transform with an added offset. Any transform, to which offset will be applied. Current figure. It can be None if units are 'dots'. Specifies the offset to apply.